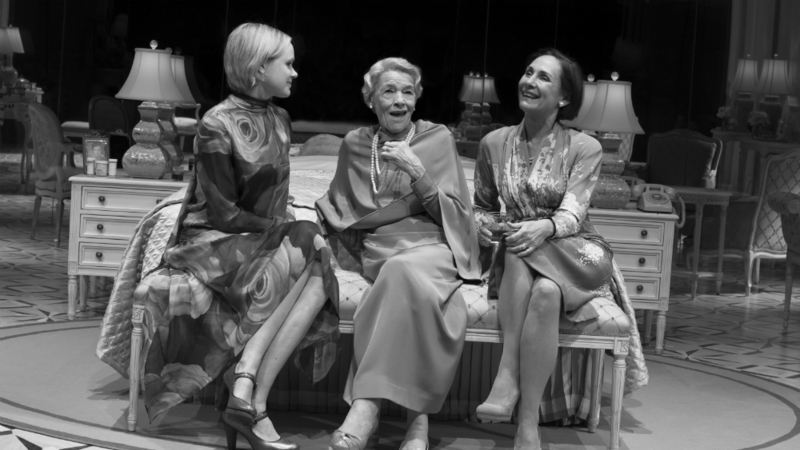 The opportunity to see Glenda Jackson or Laurie Metcalf work with such an amazing text is one you can't pass up, so particularly the opportunity to see them working together on Albee's Three Tall Women is a once in a lifetime event. Joining them is the younger, but still highly experienced Alison Pill, all under the skilled and steady direction of Joe Mantello. The set is beautiful; conveying the lavish existence while maintaining a minimalism that gives it a coldness. This house, and this room in particular are not places of happiness. In act two, when we step "through the looking glass" so to speak, and the room mirrors and mirrors in a never-ending reflection of both the actors and the audience, it calls into question our own reflection of ourselves in this moment, and the moments that passed. The play is about memory, and about reconciling the ideals and dreams of our younger self with the realities of survival and the choices we make as we age. It is funny. Extremely funny, yet jet-black in its undertones, and Mantello mines each and every moment of laughter to its full and dark extent. The humour in the performances, particularly from Jackson as she reflects on 91 (or is it 92?) years, makes the cold reality of aging, choosing, and forgetting all the more sad. Metcalf's comic timing is ideal for this interpretation of the play, humour used to shield the pain of her experiences so that when her son appears, the shift to anger is so wonderfully pained. The humour isn't there to protect her any longer. Jackson is sublime. Her performance was salty, spunky, witty, and real. The pure craft we watched on display for an hour and forty-five minutes is like nothing else - I am so grateful to have had the opportunity to watch her live and in person, to feel her radiate up to the balcony with such minimal effort. Alison Pill has the desirable but challenging task of rising to these two forces of nature. She does well for the most part, shining particularly in her monologues in act 2. It was definitely interesting to hear the difference in vocal skill between Pill, who primarily worked in film and Metcalf & Jackson who have countless years on the stage. Pill had to work to be heard and to send her thoughts to the back of the room, while Metcalf and Jackson just existed and soaked up the massive room. This play, which centers on womens' experiences and choices throughout their life feels altogether even more important and poignant in today's world. Unlike many plays which age and grow distant from us, this one actually seems more and more familiar as time goes on.